For many people, football’s international break is a chance to catch up on missed shows such as The Walking Dead or Eastenders. For others like myself it was a chance to delve into a new sport. 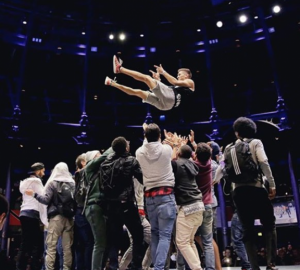 After coming across Sky Sports’ promotion of the Red Bull Street Style world final on their website, I was filled with curiosity. With the winter months in full flow, most people would be against the idea of going out on a chilly, blustery evening, but I was willing to broaden my horizons and watch a new sport. Tickets cost £10 – peanuts in an age when prices to see elite sportspeople in action tend to be excessive and immoderate. A tenner to witness some breathtaking displays of showboating in a world final was without doubt value for money. 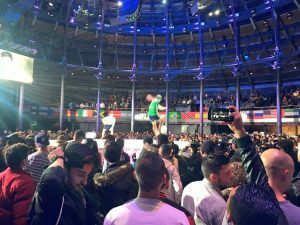 The event took place at the Roundhouse in Camden, north London, and I was filled with excitement and eagerness to see a different style of football. 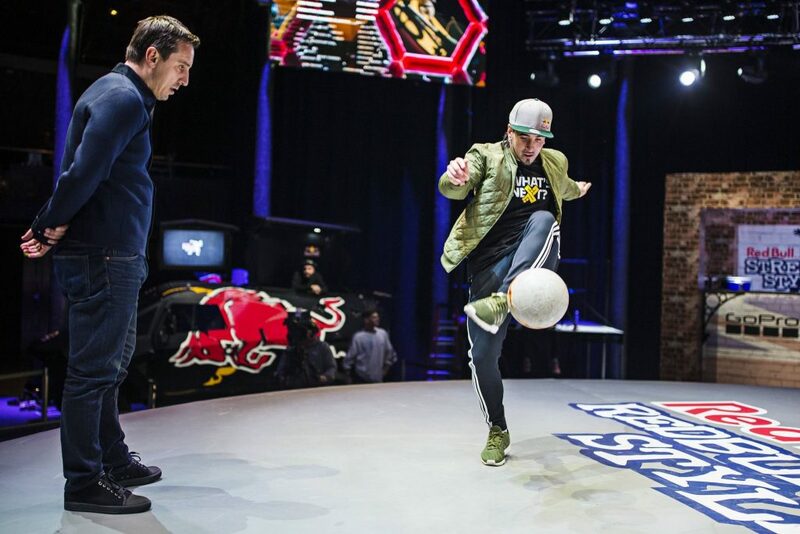 The Red Bull Street Style is freestyle football’s premier tournament, where the world’s top tricksters go head-to-head against one another in a bid to impress the judges with their extravagant abilities. The competition burst onto the scene in Brazil in 2008 and has also taken place in South Africa, Italy and Japan. The 2014 event, back in Brazil, saw the most fluent freestylers from 44 nations battling it out for the biggest prize within their sport. 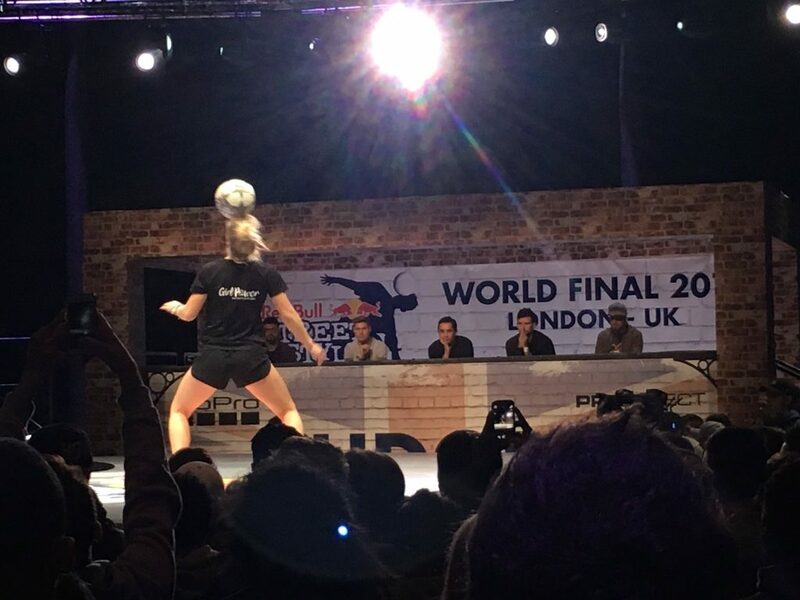 Britain’s Andrew Henderson, who has performed at Old Trafford and put Barcelona’s Neymar to the test in a freestyle battle, captured his first title with some dazzling showboating. The rules are pretty straightforward. Three minutes, two players, one ball and one victor. As I warmed up with burger and chips, excitement rippled through the Roundhouse crowd as it was announced that former Manchester United and England defender turned TV pundit Gary Neville was on the judging panel. He was joined by Sean Garnier, the winner of the very first Red Bull Street Style in 2008. Since then, the French star has been influencing and tracking the pulse of the sport and his name needed no introduction to the fans of freestyling. The cheers were deafening for both Garnier and Sky Sports pundit Neville and the volume only kept increasing. The atmosphere around the place was louder than most match days at the Emirates Stadium, with ‘oohs’ and ‘aahs’ whenever someone did something amazing with the ball, plus moans and groans when competitors failed to get out of their comfort zone. It was a superb showcase of jaw-dropping tricks and seemingly impossible transitions that left everyone astounded. With the biggest names in freestyle looking to stamp their authority on proceedings, the level of competition was so high that no-one was safe from elimination. Portugal’s Ricardinho, one of the favourites to win, went out in the quarter-finals. Another casualty was Ireland’s Daniel Dennehy, who oozed class and ability but was defeated by Carlos Alberto Iacono, the man from Argentina who was hoping it would be third time lucky in 2016. After coming up just short in the last two tournaments, the man nicknamed ‘Charly’ was determined to claim the crown in London. 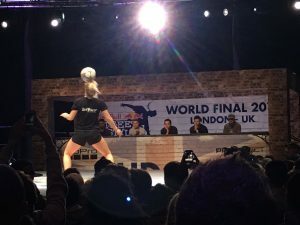 Ahead of the men’s final, the world’s best female freestylers got their chance to show off their talents. The final between Melody Donchet of France and Poland’s Aguska Mnich was a truly gripping encounter. In the semi-finals, Donchet had seemingly given her all to defeat long-time rival and double world champion Kitti Szasz of Hungary. But there was more to come from her. In a fearless performance, the French star defeated Mnich with seamless transitions from standing to sit-down tricks and back up again. Donchet’s ability to persevere when most fans felt she had nothing left in her bag of tricks was simply remarkable. She secured her second consecutive title and, in the process, elevated her reputation to a new high. In the men’s final, Iacono managed to get the monkey off his back by defeating Japan’s Kosuke Takahashi. The Argentinian’s ability to ignore the noise from the crowd was one of the main reasons to why he delivered on the big stage. At times it seemed like Iacono did have wings as he delivered the technical moves for which he is best known. He sealed victory with one of the hardest handstand tricks ever seen, as he juggled the ball flawlessly on his calf. And boy, did he deliver. For more information about the competition, visit the Red Bull website. ← Idea Generation Processes – How do you convert ideas into finished work?